KIEV, Ukraine -- Ukrainian WBC heavyweight boxing champion, Vitali Klitschko, has confirmed he will run in the country's 2015 presidential election. Vitali Klitschko, leader of the Ukrainian opposition Udar (Punch) party. He made his announcement in response to a bill passed in parliament that bars candidates who have lived outside Ukraine during the past 10 years. The pro-Western Udar party MP has permanent resident status in Germany. "Everything that has taken place in parliament today... does not intimidate me and will not stop me," he said. "To head off these various schemes and attempts at getting even with me as a possible candidate, I want to declare this: I will run for president." Mr Klitschko is the first declared contender against the incumbent, Viktor Yanukovych. He has actively campaigned against what he calls the president's "authoritarian policies". The bill adopted on Wednesday amended Ukraine's current tax code. It now states that if a Ukrainian national holds permanent resident status in another country they cannot be considered a resident of Ukraine. Previously, they only had to live in Ukraine for at least 180 days a year. According to the constitution, a presidential candidate must have been resident in Ukraine for 10 years prior to polling day. Mr Klitschko said the amendment clearly had a "political context", something denied by a member of Mr Yanukovych's Party of Regions. The 42-year-old boxer heads the Ukrainian Democratic Alliance for Reforms (Udar), whose acronym means "Punch". It came third in last year's parliamentary elections. 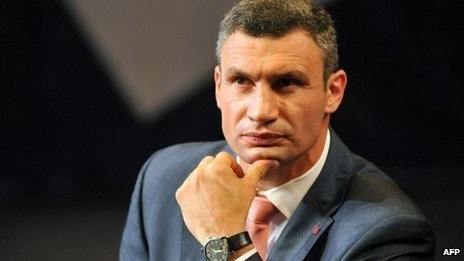 "My main goal is for Ukraine to be a European, modern country with European standards of life," Mr Klitschko told the BBC in August. "I will decide with people who have the same vision, the same dream, to go into politics and from the inside to change the situation." He has spoken out against corruption in the country and the jailing of former Prime Minister Yulia Tymoshenko for abuse of office - a charge that her supporters claim was politically motivated. "We can't be a democratic country with political prisoners," he said. Mr Klitschko is also pushing to strengthen Ukraine's links with the EU. "We see our future in the European family. We are European with our mentality, with our history," he said.